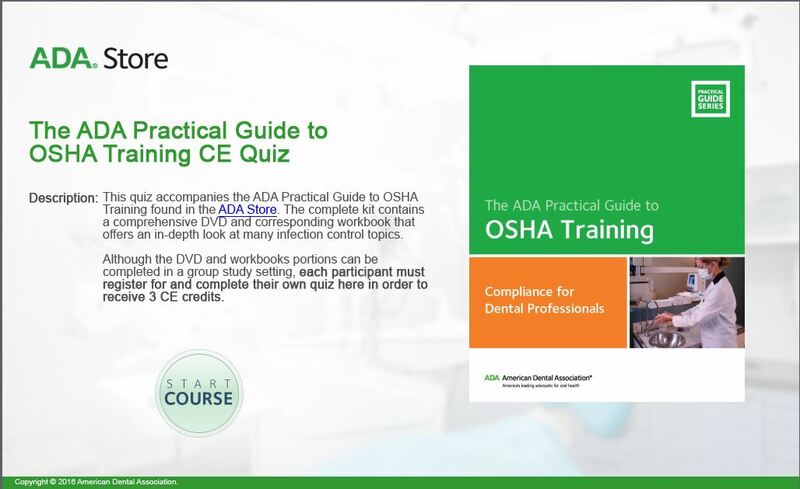 This quiz accompanies the ADA Practical Guide to OSHA Training found in the ADA Store. The complete kit contains a comprehensive DVD and corresponding workbook that offers an in-depth look at many infection control topics. Although the DVD and workbooks portions can be completed in a group study setting, each participant must register for and complete their own quiz using their own account in order to receive 3 CE credits. 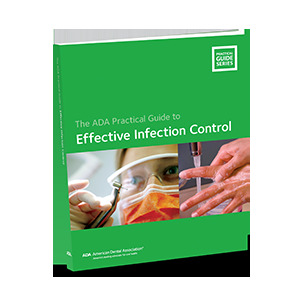 This quiz accompanies the ADA Practical Guide to Effective Infection Control (2016) found in the ADA Store. The complete kit contains a comprehensive 40-minute DVD and corresponding workbook that offers an in-depth look at many infection control topics. Click here to purchase the full book and DVD set. Although the DVD and workbooks portions can be completed in a group study setting, each participant must register for and complete their own quiz here in order to receive 3 CE credits. Dental team members can learn how to protect themselves from exposure to potentially infectious agents in the dental office. This course shows ways to reduce risk of acquiring a bloodborne disease through occupational exposure by understanding and using immunization, adherence to standard precautions, and disinfection and sterilization. This course also explains the two main OSHA standards that affect dentistry, the Bloodborne Pathogen Standard and Hazard Communication Standard. For information about purchasing for your dental team, please contact us at 800.621.8099 or ce_online@ada.org. 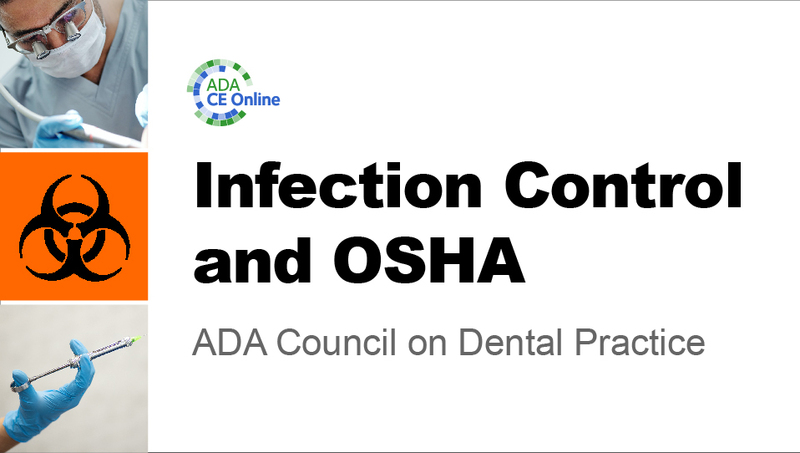 Infection Control and OSHA shows how to protect against exposure to potentially infectious agents and hazardous chemicals in the dental office. It explains several ways to reduce the risk of acquiring a bloodborne disease through occupational exposure including immunization, adherence to standard precautions, and disinfection and sterilization and the control and prevention of exposure to hazardous chemicals. The course also includes reasons to contact state boards of dentistry, instructions on how to avoid infection in the dental laboratory, and instructions on how to clean, sterilize, and disinfect potentially infectious items and how to monitor the sterilization processes. This course will introduce the proper selection of hand hygiene products and what to use when, and effective hand washing techniques. Proper selection of hand hygiene products and effective hand washing — simply knowing how to lather your hands and how long to wash them — is essential in reducing the risk and spread of infectious organisms to patients and staff in healthcare settings, including dental offices. Participants in this course will be introduced to evidence-based information that will facilitate compliance with and the implementation of infection control rules and recommendations made by federal, state, and local agencies and professional organizations. While the transmission of pathogenic microorganisms in the oral healthcare setting is rare, healthcare-associated infections (HAIs) do present a potential hazard to OHCWs and patients alike. 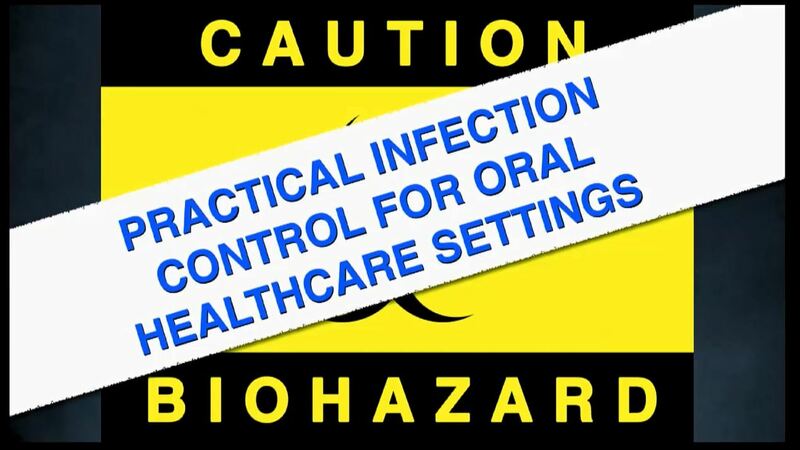 To prevent or minimize HAIs among OHCWs and patients, oral healthcare facilities are mandated to develop a written infection control/exposure control protocol that extends to all aspects of the clinical process.